Beatrice is a multimedia journalist who enjoys reporting on education, technology, art and culture. 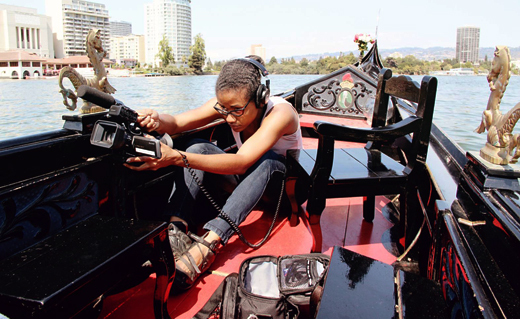 A native Detroiter, she received a BA in Journalism Honors from Wayne State University, and her love of dynamic storytelling is why she studies multimedia at UC Berkeley’s Graduate School of Journalism. She is an intern at 3D software giant, Autodesk, which aligns with her interest in technology and software applications. Beatrice is also an active member of the National Association of Black Journalists, the Online News Association, Investigative Reporters and Editors and the Society of Professional Journalists. Beatrice attributes her love of journalism to exposure at an early age and her proposal aims to incite the same passion for news and information in future generations. Journalism hit me at an early age. Growing up I often revisited the past with my grandfather via family photos. We read the newspaper together and, at age seven, I interviewed him for my aunt’s cable access show. I fell in love with journalism then and I wanted to pay those interactions forward by developing a web and mobile app that teaches children the value of journalism in a visual, interactive and engaging way. One of the biggest challenges the journalism industry faces is reaching young people. My application will deliver news using a visual centric and mobile-friendly platform on which text can be combined with photos, videos, illustrations, animations and infographics — the kinds of visual content that has made services like Instagram and SnapChat so popular. This first aspect will help kids learn about and share news. The second component will help them shape news by having a newsroom they can use to report the news of their world in their pocket. This application will tie into a device’s camera, and have a media-editing bay, a way to pull in YouTube clips for b-roll and a notepad for publishing text alerts. They’ll thus have a mobile toolkit they can use to cover breaking news in their neighborhoods. Six-word memoir: Using design to change our world. Favorite fictional character: Luigi from Mario Brothers. He is sometimes overlooked in the franchise, so it’s no wonder he has his own death stare. I became a journalist because the industry offers tremendous flexibility. It combines my love of research, education, technology and design. I also attribute weekly newspaper reads with my grandfather and early journalism immersion to my decision. With that said, as a journalist now, online media is inescapable and I hope to use code and visual design to advance the profession. What happens during your average day? I’m a mother, so my days are usually full of copious amounts of caffeine, cleaning up (seemingly never-ending) messes, studying or impromptu field trips with my husband and our children. During the school year I take my children to school, go to school myself, study, pick up the children, work on photo/video/coding projects and sleep. You want to engage young people with journalism. Why is that important? It’s important to teach people of all ages the value of news. Pulling in young people and early engagement is crucial in spreading that message. We teach reading, math and science to children as early as kindergarten and journalism allows young people to become more aware of their world. You plan to create an app that will appeal to younger people. How will your app be different from what’s currently out there? In addition to presenting news in an interactive manner, my app allows younger people the opportunity to capture the news around them. I’m giving kids interested in journalism a way to dig deeper. How can news organizations better engage with its younger audience? News organizations can inject elements like infographics, backstories or even humor (when appropriate) into reports. I think television shows like “The Daily Show” or the “The Colbert Report” are successful because they find humor in news events. Granted, these shows are on a comedy network, but they demonstrate how news doesn’t have to be stale. What will the newsroom look like fifty years from now? My aim is to create a way for cub reporters to have a newsroom in their pockets. Cloud computing and other technological advances may allow media producers to spend less time in physical newsrooms. However, there will always be a need for collaboration and physical workspaces.